Review: When elderly Colonel Protheroe is found shot in the Vicar's study, there is no shortage of suspects. His wife has been cheating on him with a young artist. His flighty daughter has been acting strange for quite a while. There are a few new people in town including an archaeologist, his young secretary and a mysterious older woman. So many suspects...and it doesn't help that the victim was not well liked by anyone. 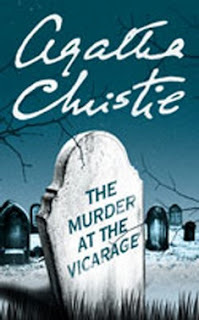 When 2 people confess to the crime, the local magistrate works the case with the help of elderly spinster Miss Marple. Once again I could not figure out the mystery, darn you Agatha! This just makes me want to read more of her books to see if I can figure out the killer. A fun, quick, read. I recommend for anyone who enjoys mysteries.